Picking up the Washington Post this morning my jaw dropped. I couldn't believe what I was reading. The Sierra Club had endorsed challenger Vincent Gray over incumbent Adrien Fenty for the Democratic nomination for mayor of our Nation's Capital (winning the September 14th primary is tantamount to a November election in this heavily Democratic city). Gwyn Jones, chair of the Sierra Club D.C. chapter, was quoted as saying that "our decision was not a difficult one." Not a difficult one? That smug comment is an indicator that this was a wrong-headed decision from an ungrateful organization that has betrayed the greenest mayor Washington, D.C. has ever had. So like the rest of their insecure and fickle Washingtonians, they would prefer their leader to listen to them instead of getting results. I guess reforming the education system, lowering the crime rate, improving city services and increasing the population are not enough. They want a mayor who will make promises he can't possibly keep and criticize our current mayor for making tough decisions that a "consensus-builder" like Gray will never make. But I digress. I'm not even talking about how much our beloved Mayor Fenty has done to green this city after decades of neglect and a car-first mentality. In an email response, Political Committee Chair Chris Weiss stated that the Gray endorsement was a unanimous vote of both the Sierra Club political committee as well as a unanimous vote of the Sierra Club Executive Committee. Formed a Green Team of over 80 members from over 40 agencies. District Department of the Environment launched a Green D.C. website to educate and inform residents about green issues. 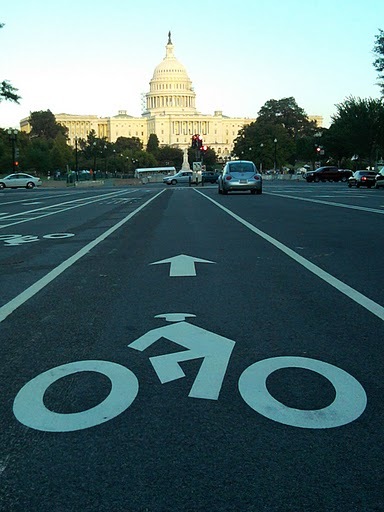 Installed bike lanes across the city including a bike lane down Pennsylvania Avenue, symbolizing the city and the nation's commitment to going green. Promoted the Circulator bus, which has been a great success by getting people out of their cars. The Circulator continues to expand, most recently adding a Rosslyn-Georgetown-Dupont Circle route. Instrumental in securing expanded bike sharing in D.C. and opening the new bike rental and storage facility at Union Station. Put in place Gabe Klein who has transformed the Department of Transportation and has set in place an ambitious plan for 37 miles of streetcar lines of which two -- H Street NE and Anacostia -- are under construction and should be up and running by spring of 2012. Picture I took this evening of the new Pennsylvania Avenue bike lanes. Still not convinced? Below is video I took of Mayor Fenty and Mr. Gray talking about green issues at a debate at 6th and I Historic Synagogue. At a later point in the debate (not in the video) Gray talks about eliminating bus and bike lanes to make more room for car commuters (many of whom drive in from Virginia and Maryland). 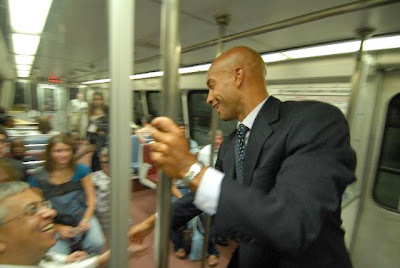 In this video Mayor Fenty touts his impressive record of installing bike lanes across the city and promoting alternative forms of transportation with initiatives such as adding more Circulator bus routes and moving ahead with laying down streetcar tracks in H Street NE and Anacostia. Gray participated in the worst kind of political pandering at the next Washington Post-sponsored debate at the Newseum by stealing Mayor Fenty's lines from the previous debate and reversing his comments by saying that D.C. needs more bike lanes and less people driving. Of course he wasn't challenged about his cynical flip-flopping. But he did promise to lower parking meter rates which will attract even more motorists into the central city. It is easy to make promises Mr. Gray and tough to actually deliver, which is what Mr. Fenty has been doing for the past four years. Perhaps this city just isn't ready for a forward-thinking and take-action kind of mayor such as Adrien Fenty. Well, if that is the case then it will truly be a sad day in our Nation's Capital on September 14th.